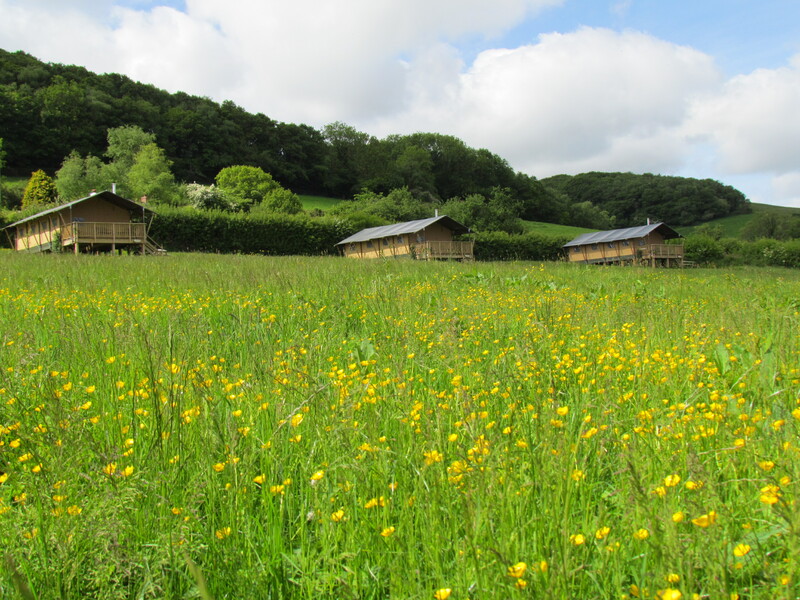 Western Meadows Glamping (Part of Westcountry Glamping Ltd) is a completely new experience for those who want peace and quiet, or travelling out for the day to the numerous attractions inland or coastal (North and South). Our three Safari tents, Campion, Celandine and Honeysuckle, sleeps six plus a cot, are large and well equipped with king size bed, 2 single beds and double den bed. Bathroom and kitchen inside the tent, with wood burning range cooker for cooking on and baking in, dining area and lounge, out to covered veranda, with stair gate for safety, all built on a sturdy insulated wooden base set in stunning countryside in Cornwall. n.b Hover mouse pointer over slideshow to get picture information. Dogs on leads welcome; A dogs only area is provided with bin. Please bring you own dog bedding and towels. There is an outside shower for cleaning paws/boots. We have connections with a local dog walker and carer Joanne, should you want a pet free day, evening, or night. Must pre Book prior to holiday (see Animals and Attractions page) . Towels and bedding are included and basic cleaning products/cloths/scourer. Wood for the range cooker included. There is mains power for electric kettle and toaster plus a standard lamp in the lounge, table lamp in the kitchen with a light in the bathroom. A small mains power fridge freezer. Mains pressure hot and cold water supplied to kitchen and interior bathroom with double size shower, flush toilet and basin (The mains water is soft and lovely to drink). There is a four ring gas hob out on the veranda for cooking when you don’t need the range cooker. We have within the large 3.75 Acre field a large trampoline, swings/climbing frame. Next to the Kensey River is a communal fire pit area with rustic seating to gather around in the evening and meet your fellow glampers. Ample parking, two vehicles per tent, is at the field entrance and is on hard-standing slate chippings, please pull in to face the river near to the woodshed. We can take in in your online shopping order (Tesco is our local store) so you don’t have to carry it with you in the car. Please advise by email your delivery times, delivered to your tent in our truck. n.b It’s easier for us after 1600 hrs, as we might be still be completing changeovers. We have an on-site honesty shop for those basic requirements. Out of courtesy to our other guests the tents and veranda areas are strictly no smoking . Located near to Launceston just over 1 mile away from A30 over the hill in the Kensey River valley.